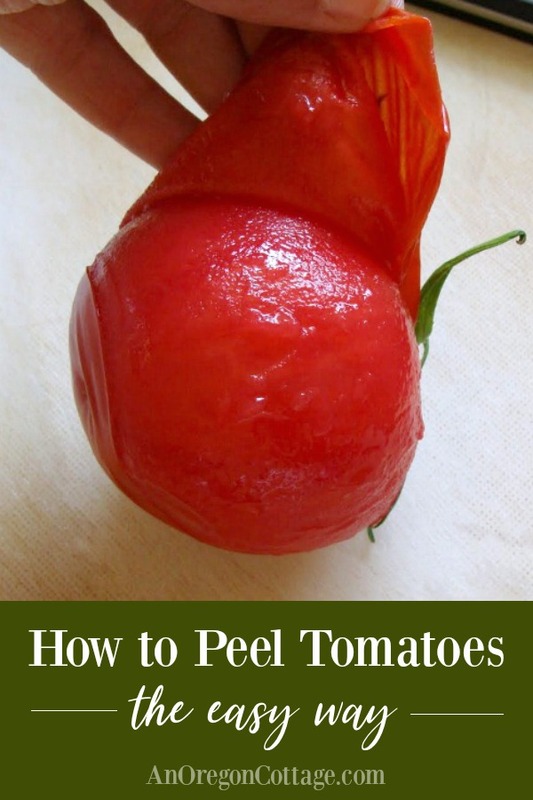 Have you ever wondered how to peel tomatoes when faced with pounds of them without having to deal with each individual tomato? 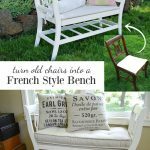 I did – and I found an easier way! 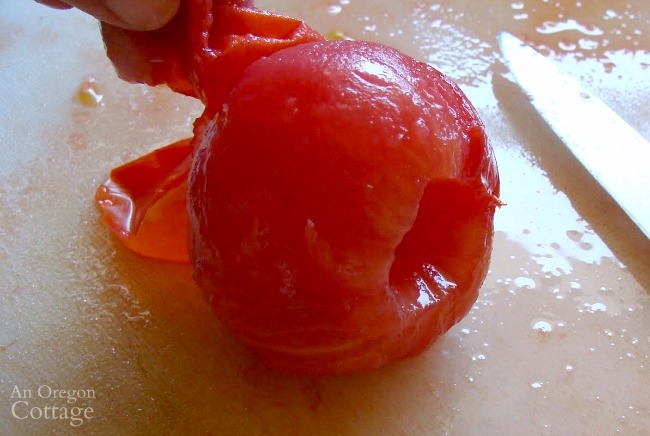 So, are you wondering if this is some crazy-new technique for peeling tomatoes? 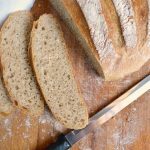 Something different than the tried and true dunking-in-hot-water-method? Well, yes – and no. You do still dunk in water, but the easy way to peel tomatoes that I’m talking about is something you don’t have to do. And when you’re faced with heaps of tomatoes in season, this is a significant time saver. This is the only way I peel tomatoes now after I discovered it, and it’s a lot easier than the typical method – really. 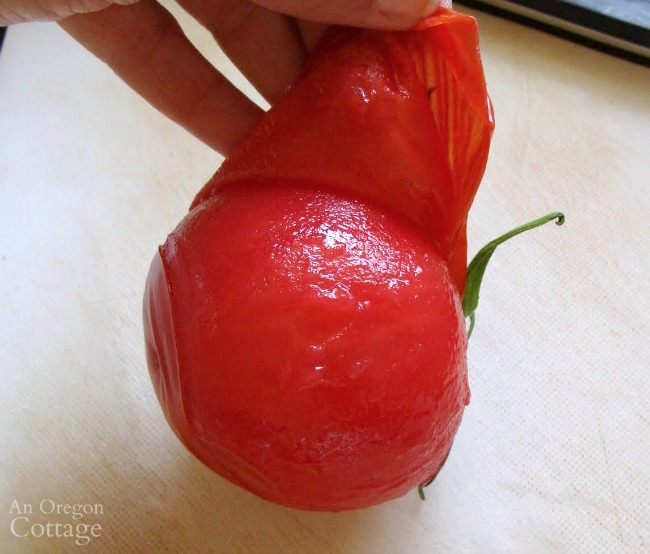 What is the standard method for peeling tomatoes? The standard, find-it-everywhere you look, method for how to peel tomatoes involves making an “X” in the bottom of each tomato before dunking in boiling water. Yes, each and every tomato. I don’t know about you, but when I’m facing mounds of tomatoes from the garden that all need to be processed into salsa, sauce or canned, I cannot be bothered with this tedious task. I mean, sheesh, it already takes long enough. If you’ve been reading AOC for awhile you’ve probably realized that I try to find the easiest way to do things (um, lazy? I like to think smart…). 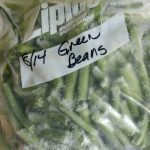 So years ago when I was faced with my first piles of tomatoes from the garden I simply decided to see what would happen if I didn’t cut the “x” in the bottoms first (I know, I’m a rebel like that – it’s also why I found this easy way to freeze green beans and these easy ways to garden). Guess what? The skins start to peel all by themselves. Yeah, I’ll go with that. Update: I used to use peeled tomatoes for everything from salsa, to chutney, to sauces, but that was before I realized using a food processor to chop tomatoes for salsa and chutney – and using this electric sauce maker for sauces – meant I could just leave the skins on. Now I peel tomatoes this easy way a lot less – really only for basic canned diced tomatoes or canned bruschetta – which is the easiest way of all, right? 1. Begin with the amount of tomatoes needed for the recipe. Weigh them and have them ready to go while your largest pot filled half-way with water is coming to a boil. 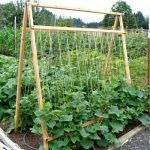 Add as many of the weighed tomatoes that will fit in a wire produce basket with handles – without doing anything to each tomato. Dunk them in the boiling water for about 30 seconds until you start to see some of the skins start to crack and curl. 2. 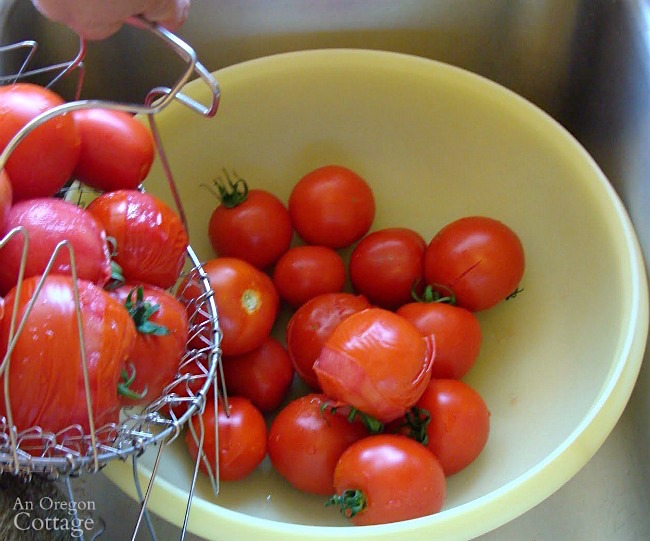 Immediately dump the boiled tomatoes into a large bowl (or clean sink). The nice thing about having them in a bowl is that you can move them around and still can use that side of the sink if needed. Which is nice if you’re dealing with a lot of tomatoes – you can use as many bowls as necessary. Repeat as necessary until all the tomatoes are dunked and in the bowl. 3. Set a couple tomatoes at a time on a cutting board and peel. Most of the peels will be cracked and will come right off when you pull them. 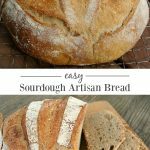 Simply core and cut these as needed for your recipe. 3c. And then pull the peels back from the cored area. The the peels will just slide off super easy. 4. 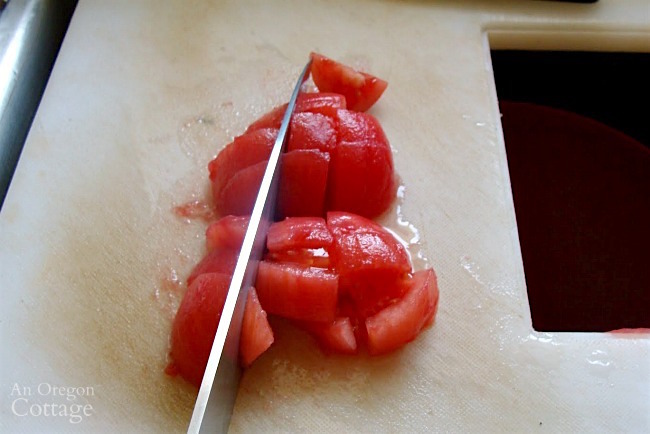 Proceed with all of your tomatoes as needed, chopping them for your recipe after peeling and moving them off to the side. Note on the cutting board in these photos: I’ve used an over-the-sink cutting board when I’m preserving for years and really recommend it. What I like is that it sits over the sink and I can have a bowl sitting under the hole. Use your knife to slide all peels, ends, and seeds right into the bowl and when it’s full you can easily pick it up to empty. There’s also no worry about all the juices from fruits and vegetables getting all over the counter, which I love. Best reviewed plastic over-the-sink cutting board. A less expensive, but still good reviewed plastic over-the-sink cutting board. For those who’d like a wood option (there aren’t many), this pretty over-the-sink cutting board has the best reviews (you will need to keep this maintained with oil, though). 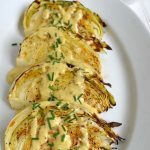 I’ve no doubt that I’m not the only one to discover what I think is the easiest way to peel tomatoes – have you tried this yet? 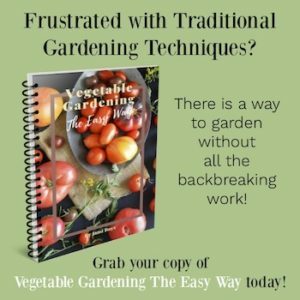 If not, I hope you will join me using this method when you need to – it really does make canning diced tomatoes go so much quicker! 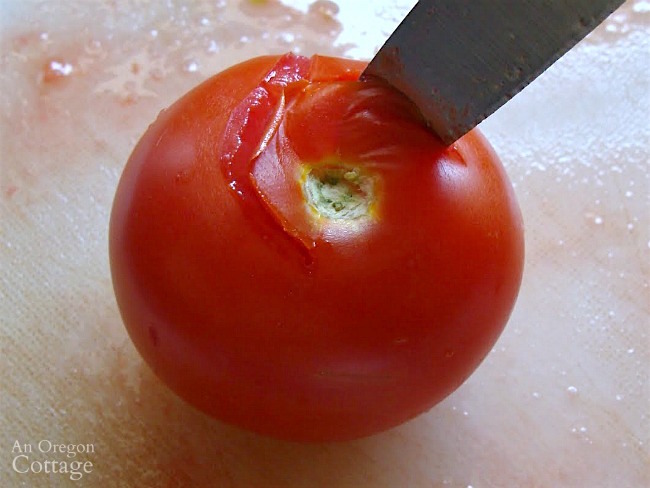 Is peeling tomatoes a kitchen task you do? 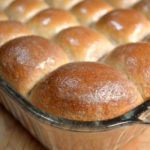 What recipes do you use them for? I’m totally with you on finding the easiest (laziest) way to do things. I’ve found that freezing my tomatoes whole (just rinse and pop the stems off) as they ripen then process later works well. When I’m ready to make sauce, I rinse the skins right off under hot tap water. 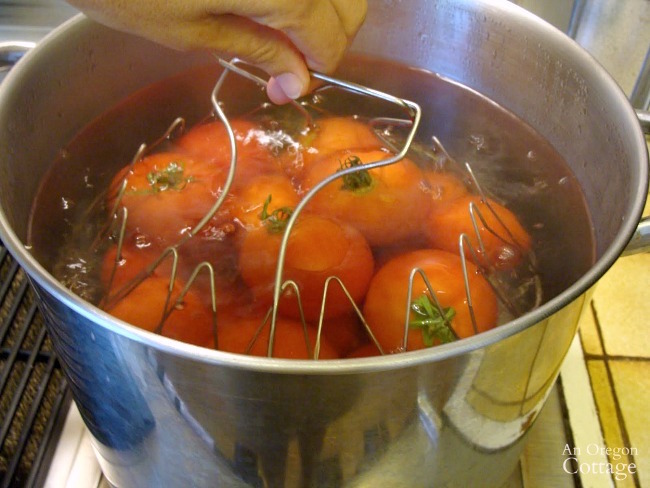 Plop the peeled tomatoes in a large colander over a bowl and let thaw. Save the watery juice and can it too for soup base. Because the cells are broken with the freezing, it takes far less time to cook down the sauce. I then roast the tomatoes a bit in the oven and run through my food mill. If necessary, cook down to desired consistency and can per OSU Extension directions. Easy peasy. 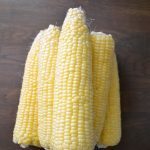 No blanching! And…I can do it in the fall when it’s NICE to have a hot pot of something going!! You also can plunge the blanched tomatoes into ice water. Just partially fill your sink with water and dump some ice in before you put tomatoes in the boiling water. The ice bath will stop the cooking process… and the tomatoes will really start to peel as they chill. I grew up canning and ice bath for tomatoes is a fabulous trick. Thanks! I’ll have to keep my eye out for one. I’ve only got 4 small tomatoes out of my garden this year so far, so I don’t think I will be doing any canning. Ah well. I shall try again next year. I tried to find one and there’s one on Amazon that I’ve put in my sidebar of things I recommend. It’s bamboo and more expensive, though. Maybe a kitchen store? Cool cutting board. Do you remember where you got it?